The Financial Times has a long piece on a trip to the Aysen region, site of a controversial hydroelectric project which would flood a pristine area of Chile’s Patagonia: http://www.ft.com/cms/s/2/922f567a-98cf-11e0-bd66-00144feab49a.html. 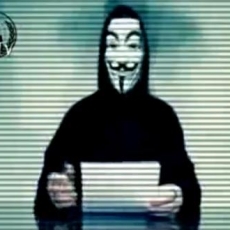 The hacker group Anonymous posted a warning on You Tube threatening Chilean and Peruvian government web sites. In the bad old days of military rule, Chilean authorities would carefully watch public opinion by tapping telephones, intercepting mail and maintaining a network of informants throughout the country. A modern democratic government can keep its ear to the ground via polls and following the media, including blogs and social networking sites. But at what point does this monitoring become a violation of citizens’ rights, and what is an appropriate use of the information gathered? The government of Sebastian Pinera is monitoring social networks such as Twitter and Facebook and using a private company for this purpose. A Santiago firm, BrandMetric, uses special software to gather and study the opinions posted online, an enormous task given that Chile has an estimated 7 million Facebook accounts and is one of the most wired countries in the region. The company’s general manager told Radio Cooperativa that it was not peering into people’s private lives but observing and reporting public sentiment on issues such as the HidroAysen power project. Government spokeswoman Ena Von Baer has defended the policy, pointing out that “public networks are public networks” and that officials are not doing anything other than learning Chileans’ views on public issues. According to press reports, BrandMetric is being paid the equivalent of more than $300,000 for its services. An opposition politician, Senator Pedro Munoz, has asked the Comptroller General to declare this practice illegal, charging that it violates laws protecting personal data and individual privacy. Meanwhile, the issue has drawn the attention of a cyber hacking group calling itself Anonymous, which has launched previous attacks on web sites, including those of the U. S. Central Intelligence Agency, Visa and MasterCard. The group posted a video on You Tube showing a masked figure similar to the character in the 2006 dystopian film V is for Vendetta. Speaking through a voice synthesizer, the seated figure said the group would attack government web sites in Chile and Peru as part of a plan called Operacion Andes Libre. According to James Bosworth, a guest blogger on the Christian Science Monitor’s web site, Chile and other Latin American nations may not be very well-prepared to handle a serious cyber attack. To date groups like Anonymous and LulzSec, which launched an attack on several Brazilian web sites, seem to pose more of an annoyance than a serious threat. The Economist has two good pieces on Chile’s current political mood, noting that President Sebastian Pinera’s approval ratings have fallen to 36 percent and his disapproval rating of 54 percent is the highest any president has received since the country returned to democracy. Last October Pinera was enjoying approval ratings of 64 percent, buoyed by the successful rescue of 33 mine workers in the Atacama desert. There is widespread opposition to the government’s HidroAysen hydroelectric project, which involves building five dams on two rivers and flooding over 14,000 acres in Patagonia. On June 20 an appeals court in the southern city of Puerto Montt accepted two legal injunctions filed by opponents of the plan, ordering work on the $3.5 billion project to stop. And four days before the court ruling, an estimated 80,000 students, educators and supporters held a protest to demand more money for state education. Chile’s high school graduation rate is 69 percent, but it ranks near the bottom of the Organization for Economic Cooperation and Development rankings for member countries’ expenditures per student. 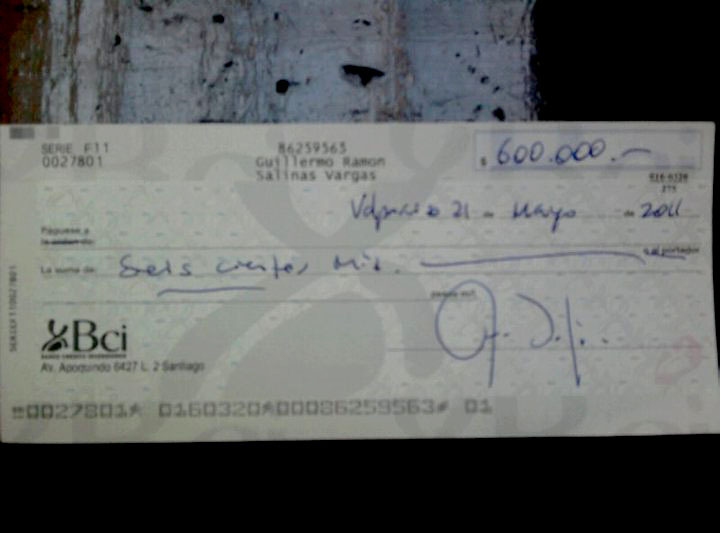 A check for 600,000 Chilean pesos, or about $1,300, to pay for lunch for Chilean labor leaders. A $1,300 bill at an upscale restaurant might not be too unreasonable if you’re buying lunch for 36 people, but spend the same amount on only six diners and you’ve got some explaining to do –especially if you’re a trade unionist trying to get the government to raise the minimum wage. The president of Chile’s largest labor organization has announced a lawsuit against the online newspaper El Mostrador for a story that he and five other union leaders treated themselves to a lavish lunch at a restaurant in Valparaiso (http://www.elmostrador.cl/noticias/pais/2011/06/10/la-nueva-forma-de-protestar-el-festin-de-arturo-martinez-el-21-de-mayo/) during antigovernment protests on May 21. Arturo Martinez, head of the Central Unitaria de Trabajadores (CUT), has said there were 36 trade unionists at the lunch, not six as the newspaper reported and charged that the story was an attempt to undermine the union’s demands for an increase in the minimum wage. The CUT wants the current minimum monthly wage of about $368 raised to $406, or about 10.5 percent, while the Pinera government has offered an increase of about five percent. The trade union joined several student, environmental and civic organizations on May 21 for a protest during Pinera’s speech before the Chilean congress in Valparaiso. Some fringe groups also joined in; witnesses reported seeing gangs of youths wearing masks throwing bottles at police, who responded with tear gas and water cannon. There were 70 arrests and 22 people were injured. The owner of Zamba y Canuta–who also happens to be a Socialist Party member–has come forth to say that Martinez had lunch with 35 other Chilean trade unionists that day. Meanwhile, the Chilean labor ministry wants to investigate whether the lunch in question was paid for out of union funds. 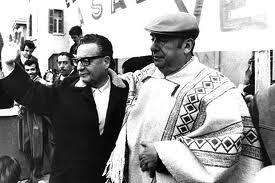 Neruda did not believe the official account of Allende’s suicide, and for many years, neither did many of the late Chilean president’s family and supporters. On May 23 Allende’s body was exhumed and is being examined by a multinational team of experts who hope to determine, once and for all, how the democratically-elected Marxist died. The initial inquiry has established that the cadaver is in fact Allende’s, but the complete investigation will take up to three months. Meanwhile, Chilean officials have opened an inquiry into Pablo Neruda’s death. The poet’s former driver recently recalled that shortly before he died Neruda complained that hospital staff had injected something into his stomach. The Pablo Neruda Foundation (http://www.fundacionneruda.cl/) quickly issued a statement rejecting this assertion, but the Chilean Communist Party requested a judicial investigation, citing other doubts about the circumstances surrounding his death. Though suffering from terminal cancer, Neruda was still able to walk around his hospital room and was talking with visitors about moving to Mexico before dying suddenly of a heart attack. The deaths of the poet and the president have been added to 725 other cases of unresolved deaths during the Pinochet regime.